What do Brad Pitt and the charming Alpine town of Bolzano, Italy have in common? The 5,000 year old well preserved ice man known as Ötzi. Brad has the outline of our prehistoric ancestor tattooed on his arm, and Bolzano is where you can see him (Ötzi, not Brad) up close and personal. Enclosed in a highly secured and sophisticated refrigerated room at the South Tyrol Museum of Archaeology, of course. When plotting our adventures last summer in Germany, Austria, Italy and Switzerland, it was a challenge to figure out which interesting towns we should use as stopovers getting from Munich to Venice. Thanks to the DK Family Guide to Italy book, I found the German/Italian town of Bozen/Bolzano just over the border of Austria and home to Europe's oldest naturally preserved mummy. A perfect stop for the wannabe Indiana Jones C&Gs. Ötzi was discovered frozen in glacial ice high in the mountains bordering Italy and Austria in 1991. Originally thought to be a lost hiker, imagine the scientists surprise when they realized his prehistoric clothing and gear aged him by a few thousand years. The frozen conditions kept him so well preserved for the past 5,000 years that scientists have been able to find out how he lived, what he looked like, what he ate, and how he died. An x-ray revealed a broken arrow embedded in his shoulder, turning Ötzi's story into an ancient murder mystery. We shared his interesting story with the boys before we left and they couldn't wait to check out a real live (not really) mummy. The South Tyrol Museum of Archaeology is home to Ötzi, the well preserved contents of his backpack, and all the research carried out over the past 20 plus years. You'll see his animal skin clothing, the weapons he carried (huge hit with the little C&Gs), bows and arrows, and shoes that somehow carried him over the ice and snow of the Alps. We were all fascinated by what this 5 foot 3 inch tattooed preserved man could tell us about our history, our genealogy, and about life in ancient times. Everything was displayed in German, Italian, and English and at the end of the exhibits you queue up to take a peek through a glass window into Ötzi's cold but cozy cell. He is kind of gross looking, but after learning so much about his journey to Bolzano it's easy to overlook the ick factor of his dried up shriveled skin and be amazed at 5,000 years of human history in front of you. After a quick run through the gift shop (thankfully no mummies came home with us) the boys headed downstairs to the kids room. 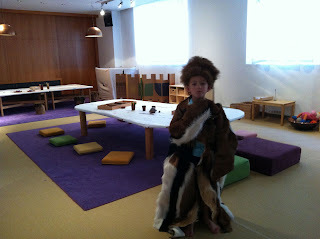 The family room is only open during the summer months and offers a great space for them to play, color and dress up. The little C&Gs loved dressing up like Ötzi and I'm sure if it wasn't so hot outside they would have begged to take the giant hats with them. 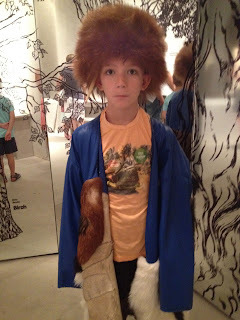 The room came in handy at the end of our tour of the museum so the kiddos could get some energy out after all that focused attention on our ice man friend. 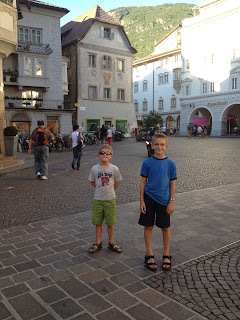 We were so sad to be only spending one night in the South Tyrol/Alto Adige region of Italy. Especially since we are huge fans of the wines produced nearby. I would love to return, and we never would have found this gem without my trusty DK guide book. Bolzano was a very charming Italian town with a German accent (Bolzano in Italian, Bozen in German) full of family friendly places to eat and drink outdoors. I'll recommend a few, along with a review of our amazing hotel in my next post. The South Tyrol Museum of Archaeology is open Tuesday through Sunday, 10:00am to 6:00pm. During July, August and December it's also open on Mondays. Entry for a family of four is €18, roughly $22US. There has been a lot about Ötzi in the news recently and PBS/NOVA has a wonderful documentary on the research scientists have been doing with our preserved ancestor. If you're thinking about a visit to Bolzano, it's a definite must watch with the kids.